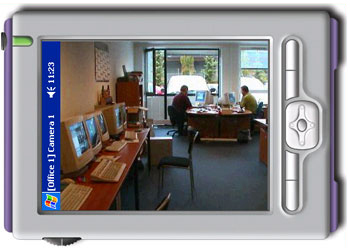 Access video recordings or live camera images from PDAs with wireless communication! This Milestone solution provides core features for installations of up to 25 cameras. This Milestone solution provides advanced features for installations up to 64 cameras. This Milestone solution provides top-of-the-line features for an unlimited number of cameras, multiple servers and multiple sites. XProtect Remote Client offers a flexible, client/server based, remote access to an XProtect Enterprise or XProtect Professional surveillance installation. Smart Client is the clever twin sister to the Remote Client and is .NET based. Instant transmission of live video streams from any camera to any PC on the network. An intelligent and flexible software solution that offers full integration between Point of Sales (POS) terminal systems and XProtect Enterprise. Central scalability of any number of Milestone XProtect Enterprise and XProtect Retail installations. Integrates network video surveillance recordings with POS or ATM transactions. Milestone software is scaled for different business applications: XProtect Basis, XProtect Basis+, XProtect Professional, and XProtect Enterprise. Case Studies of Milestone XProtect software employed in a variety of customer applications. A list of Milestone �Factsheets�, �Manuals� and Getting Started Guides� in PFD format. Access video recordings or live camera images from PDA's with wireless communication! 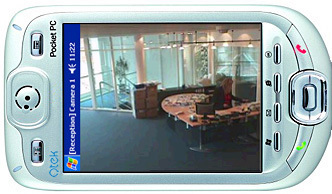 Check surveillance images with full mobility right at your fingertips! Just select the accessible cameras you want to watch on your PDA - live or recorded images. Increase efficiency, save time and resources while ensuring faster and more appropriate response to security situations. Improve safety for guards and police who can check out what is going on inside premises before entering. Enable advance situation evaluations of accident and disaster sites by emergency relief services. 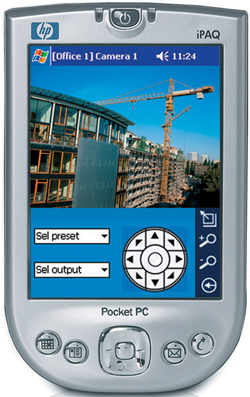 The XProtect PDA Client is available as an add-on product to XProtect Professional, licensed per PDA Client. 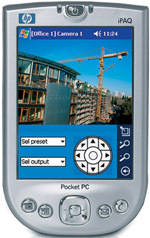 The PDA Operating System is Microsoft Windows Pocket PC 2003. [Find out more...] Milestone Xprotect PDA Client "Factsheet", 206kB pdf file.